There are 17 Memory Care Facilities in the Napa area, with 4 in Napa and 13 nearby. The average cost of memory care in Napa is $3,995 per month. This is lower than the national median of $4,650. Cheaper nearby regions include Vallejo with an average starting cost of $3,747. To help you with your search, browse the 49 reviews below for memory care facilities in Napa. On average, consumers rate memory care in Napa 4.8 out of 5 stars. Better rated regions include Vacaville with an average rating of 4.8 out of 5 stars. Caring.com has helped thousands of families find high-quality senior care. To speak with one of our Family Advisors about memory care options and costs in Napa, call (855) 863-8283. In the state of California, there are over 650,000 individuals living with memory-related diseases such as Alzheimer’s. Within Napa County alone, there are an estimated 3,000 seniors who have dementia. The city of Napa seeks to provide quality service and dignified care to its seniors, who make up 14.6 percent of its population. Napa is home to 52 assisted living facilities that have 24-hour support, delayed-egress devices and locked facility doors that accommodate regulations for dementia care that the state of California has set forth. Qualified staff within the facilities have received specialized training in dementia care services, including communication skills, the promotion of resident dignity and positive therapeutic interventions. The city of Napa is home to world-class medical facilities, including those specializing in brain health and dementia care such as the Peggy Herman Neuroscience Center at Queen of the Valley St. Joseph’s Hospital, in the event of medical emergencies or illness. Napa enjoys mild weather throughout most of the year. While winters reach an average January low of 38 degrees, the July high of 82 degrees offers plenty of warm days for seniors to sit outside and enjoy the sunshine. Seniors can enjoy fresh clean air in Napa County. The American Lung Association gave this location an excellent "A" ranking for air quality. This is good news for those who have respiratory conditions, as they can spend a lot of quality time outside for fresh air. 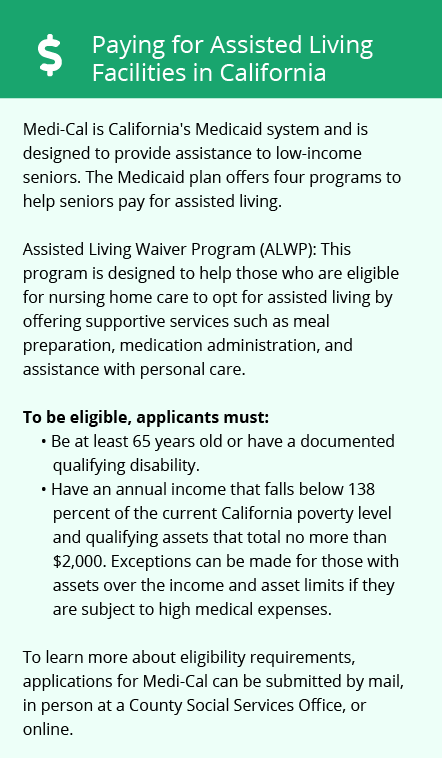 Families caring for seniors with a low income should know that California’s high tax rate of 4 percent could be a burden. While social security income is not taxed, public and private pension income is taxed. This can make it difficult for some families when seeking quality care for their loved ones. Memory Care costs in Napa start around $3,995 per month on average, while the nationwide average cost of memory care is $4,800 per month. It’s important to note that memory care rates in Napa and the surrounding suburbs can vary widely based on factors such as location, the level of care needed, apartment size and the types of amenities offered at each community. Napa and the surrounding area are home to numerous government agencies and non-profit organizations offering help for seniors searching for or currently residing in an assisted living community. These organizations can also provide assistance in a number of other eldercare services such as geriatric care management, elder law advice, estate planning, finding home care and health and wellness programs. To see a list of free memory care resources in Napa, please visit our Assisted Living in California page. 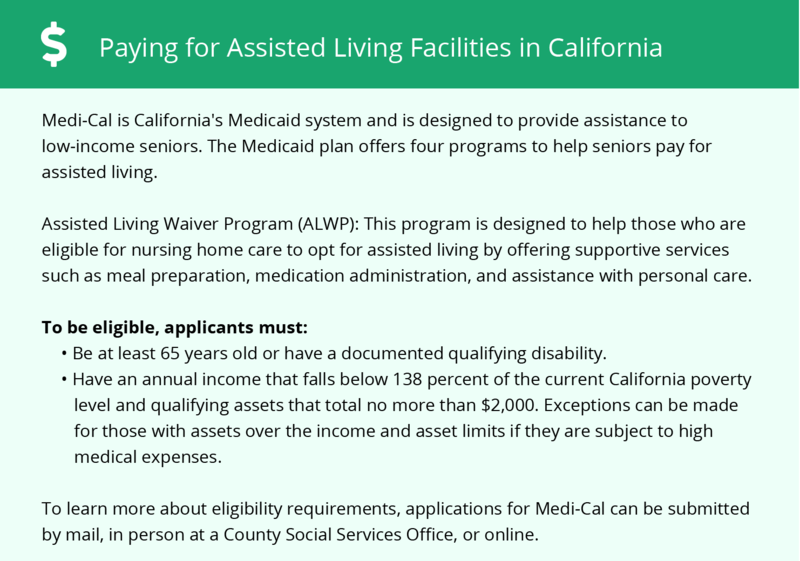 Napa-area assisted living communities must adhere to the comprehensive set of state laws and regulations that all assisted living communities in California are required to follow. Visit our Memory Care in California page for more information about these laws.